We recently received a letter from one of our readers that we wanted to share with a wider audience. The email letter is posted below. It is my hope that the book will serve as a platform for education and mobilization around the death penalty and other egregious aspects of our criminal justice system. I am hoping that you may be willing to read I Am Troy Davis, and review or write about it on your “Racial Justice Allies” blog (as well as other social media platforms that you may be a part of), so that your online community will be aware of the book, and use it as a tool in their/your discourse and analysis of these critical issues. I would also be very willing to engage directly with your readers in a discussion about the book and the issues it exposes. I am including a link to a discussion guide about the book that was developed by Equal Justice USA, in partnership with Amnesty International USA, and the NAACP. 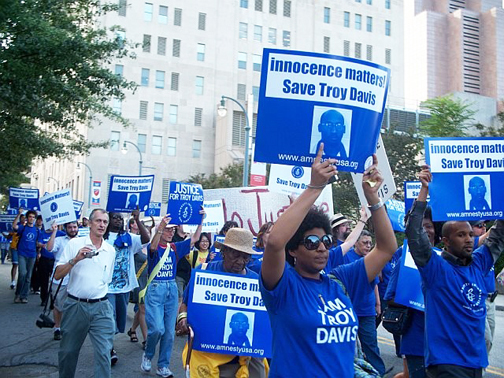 You can find more information about I Am Troy Davis here, including links to reviews. Thank you so much for considering this request, and let me know if there is any further information I can supply you!